Learn more about the reports, insights and data security at Vodafone. Vodafone Analytics is an end-to-end insight platform that offers responses to business questions by analysing Vodafone network data. It isn’t about individuals – it’s about overall patterns, rather than any one person. Vodafone Analytics doesn’t identify you, or give anyone information which would enable them to contact you. 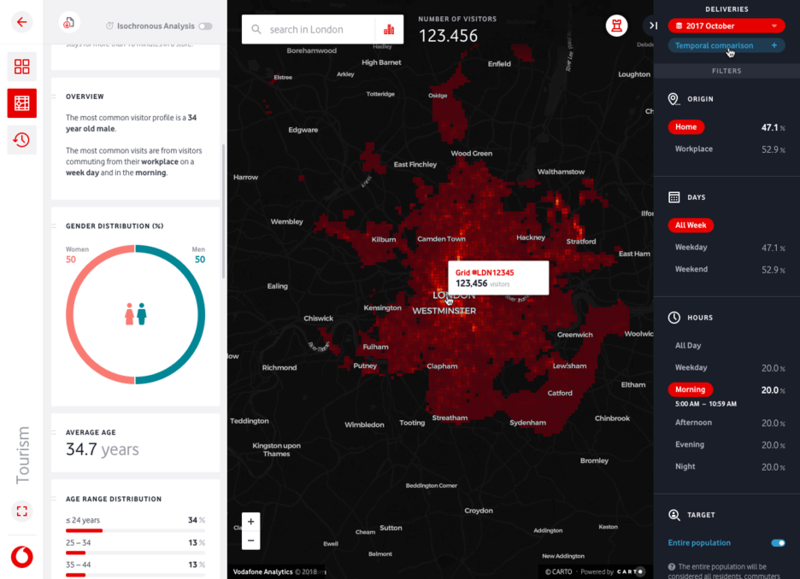 Vodafone Analytics provides insights into mobility patterns that enable better decision-making in a wide variety of sectors such as Transport, Smart Cities, Tourism, Retail and Real Estate planning. An example would be a local authority trying to work out the best way to expand the transport network. Being able to reliably understand how this network is used will enable the authority to make a better-informed decision. Or, if you wanted to open a shop, we could combine demographic summaries with movement patterns to help you decide which end of town has the passing trade you want. We collect data from our network and our customer base to produce reports for third parties. This helps them make better decisions. Vodafone Analytics uses two categories of data. Anonymised aggregated location information – this helps us and third-party partners to understand movement patterns along transport routes and in areas where people congregate. As phones move around our network, we’re able to measure their journeys between places – for example, the number of phones that travelled between Newport and Cardiff on the M4. 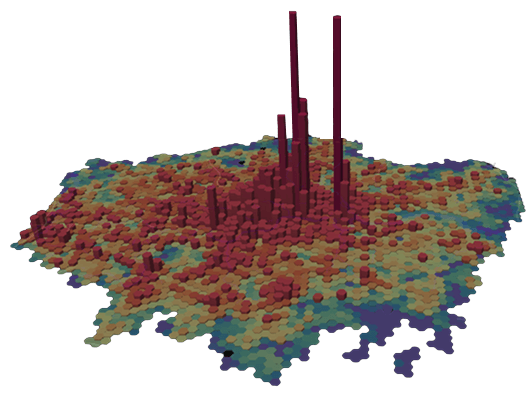 Anonymised demographic data – such as age range, gender and handset type. The data is only used in anonymised and aggregated form – the Vodafone Analytics team can’t tell who you are from it. ‘Anonymised’ means that we don’t use data that allows you to be identified or contacted, and ‘aggregated’ means that our reports don’t contain information about individuals, even in anonymised form. For example, someone might want to know how many people walking past their shop used Android devices. We wouldn’t tell them who used an Android device, but we could say that 50% of passers-by were using them, of which 70% were male. Vodafone Analytics helps organisations make better decisions. Here are some examples of how it’s used. Planning large infrastructure projects – Vodafone Analytics reports can be used in the planning of highway and public transport networks by enabling the movement patterns of phones across wide areas to be understood. Effective roadworks planning – a local council has made a decision on the basis of someone, possibly with a clipboard, counting cars or cyclists. This could mean that roadworks take place at busy times or cycle lanes get added on one road but not another. Vodafone Analytics reports can simplify this process by giving them more accurate traffic flows helping them to plan roadworks more effectively. Getting around London faster – we’re working with Transport for London and the Greater London Authority to improve traffic in London by analysing movement on the different types of transport. Delivering better shopping experiences – our data helps retailers to plan and improve the experience in major shopping centres and city centres. Helping businesses to be greener – we’re developing a product to manage commercial properties and make better use of the working environment. This means operational and energy costs are reduced by only powering areas that are in use. Vodafone has developed a comprehensive end to end, carefully crafted framework of technical and organisational controls to ensure that data is only processed for purposes which have been agreed with customers. Our approach on Privacy by Design for Vodafone Analytics offers true privacy protection to Vodafone customers in an industry-leading manner ensuring full compliance with GDPR and ePrivacy rules while allowing Vodafone to reach its commercial targets. Can I opt out of Vodafone Analytics? You can’t be contacted or identified through Vodafone Analytics. It’s your choice whether you’re included. If you have more than one SIM, you’ll need to send the relevant text from each of your Vodafone devices. All texts are free of charge when you text from the UK.